Detailed Description of Differences: The following sections may be of interest to the reader wishing to dig deeper into the differences between Viper Drill's™ mechanical system and radial jet drilling systems. As this section is a lengthy read, the reader may just wish to watch the slideshow, below, for highlights of the key differences. Drill-String Difference: Both Viper Drill™ and jet drilling systems utilize a hose, which must necessarily be flexible in order to transition around the tight radius of the whipstock. 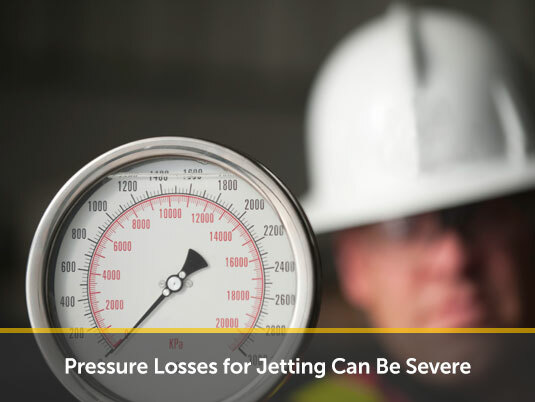 One problem this flexibility presents to jet drilling system is that it makes them prone to eroding wherever the path of least resistance takes them. 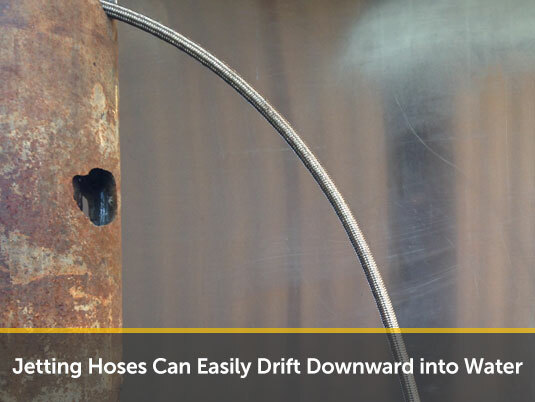 The inherent flexible of the hoses also allows jet drill systems to succumb to the forces of gravity… which can have potentially tragic consequences, if there is subtending water. 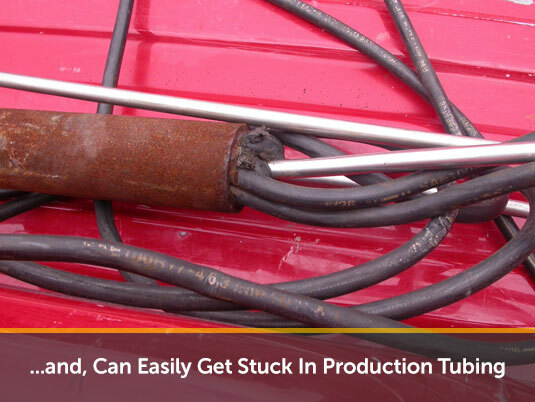 A final problem with common jet drilling systems is that the flexible hose can fold-over or coil-up on itself in the production tubing, negating drilling and providing ambiguity about whether drilling into the formation has even taken place. it allows us apply weight on bit to the cutting head. 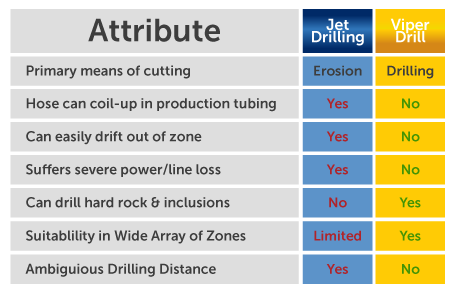 Cutting Method Differences: Jet drill systems utilize high pressure fluid—typically treated water-- in an attempt to erode the rock in front of the nozzle. The more advanced nozzles rotate– some at impressive speeds as high as 20,000 RPM. Unfortunately, rotating nozzles generate little torque and can be easily stalled, thereby causing drilling failure. This is why one cannot simply put blades on the end of these rotating nozzles in order to drill rock. 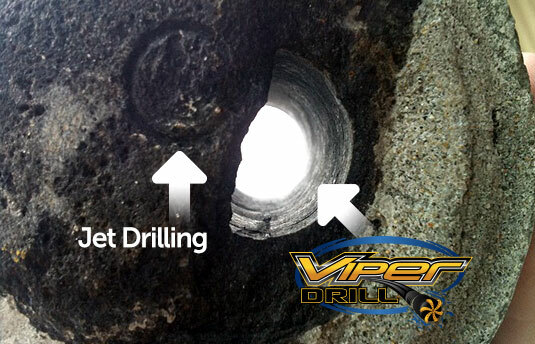 By contrast, the Viper Drill™ system utilizes a high output torque PDC-tipped drilling head. Our head rotates at a much more modest 250 RPM and forms the drainage tunnel by mechanically drill thru the rock. The difference in how the two systems drill is kind of like the difference between cutting a hole in your driveway with your pressure washer or a diamond-tipped drill bit. Power Loss Differences: One problem that plagues jet drilling systems is their severe loss of power. Operating pressures at the nozzle are commonly about 50% less than what they are at the surface (typically 10k to 15k psi). However, in order for the nozzle to generate forward thrust, another 65% or so of that remaining power must be dedicated to rear-facing jets. The basic physics of what this means is that the net power available to the forward-facing jets (which attempt to cut the hole) is only about 15-20% of power at the surface– and, this limited power is yet further reduced by any hydrostatic (fluid) head in the wellbore— and this head pressure grows as more fluid is pumped into the well. In contrast, the Viper Drill™ system does not rely upon fluid to cut the rock, so it altogether avoids these fluid-related problems. Yes, fluid still exits the front of Viper Drill™ HOTHead™ but only in order to lubricate/cool the cutting head and to wash cutting back to the wellbore. Drive Force/Thrust Differences: Theoretical thrust calculations and real world testing show that the net thrust available at the nozzle of jet drilling system is in the range of only 10-20 lbs. For anyone who has tried to drag a common 50 ft garden hose across the lawn, this is a curiously small amount of force to pull a 300 ft long jetting hose over raggedy edges in a jetted borehole. By contrast, Viper Drill™ is more like conventional vertical drilling, which relies upon the weight of the vertical toolstring to produce the weight on bit (WOB) necessary to keep the drilling face in contact with the rock. For example, we typically drill with 150-300 lbs of WOB. 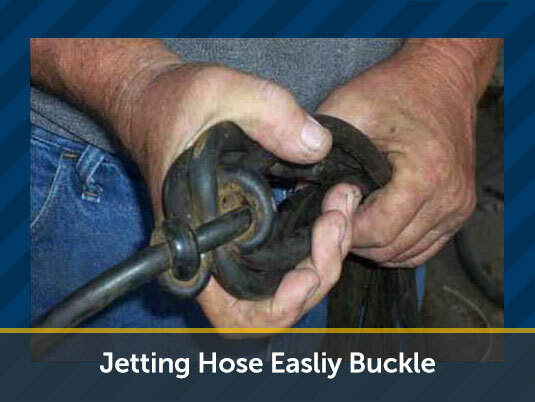 Unfortunately, the ability to ‘push the hose’ doesn’t really exist in conventional jet drilling… much like one can’t push a chain (because it wants to fold-over, instead). Plugging/Orifice Sizing Differences: To attain pressure, jet drilling nozzles require extremely small orifices– if not they would be more like a fire hoses, which has plenty of volume but at far too low of pressure to cut rock--even low compressive strength rocks. Common jetting orifices range from about .025” to .045” in diameter– roughly the size of the period at the end of this sentence. The need for such small orifices present a critical problem, namely the risk of plugging these tiny orifices with something as small-as a grain of sand or bit of rust. If this happens, forward erosion altogether stops as that nozzle can no longer erode a forward pathway. While efforts are undertaken to filter out contaminants, it is difficult to catch every last grain of sand or flake of rust– things notoriously present in the oil patch. By contrast, the exhaust ports on the Viper Drill's™ HOT-Head™ are nearly 5X this size— so the plugging risks are essentially negated. Drilling Hard Inclusions/Chert: Besides questions of whether there is sufficient remaining power at the nozzle of jet-drilling systems to erode a given matrix, there is also the problem of ability of jet drilling nozzles to cut thru chert, clast or other hard spots in the matrix. This is particularly dicey because the occurrence and location of such inclusions is unpredictable. Even driller logs do not always accurately report such inclusions, especially in thin vertically-drilled payzones—where the driller might not hit or the mud logger might not notice them. By contrast, Viper Drill's™ PDC tipped HOT-Head™ negates these problems because it can drill thru chert, clasts and other hard inclusions. Summary of Differences: To summarize, because the Viper Drill™ system does not require high pressure (or high flow) to drill thru rock, it avoids many of the problems that plague jet-drilling systems. Our High Output Torque cutting-Head assembly efficiently cuts the formation by mechanical mean– like a conventional drill bit. Moreover, since the HOT-Head™ is fitted with PDC cutting inserts, it is able to cut even the hardest of formations. Getting our drill-string into the formation is also straight forward because we don’t rely upon the pulling thrust of tiny jets, but instead we push our rigid drill-string and use ever-reliable gravity—much like in conventional drilling. Admittedly some jet drill systems can be quite alluring and website photos of surface drilled rocks impressive. But in the end, doing something on the surface (where line loss, hydrostatics and over-burden are not a factor) and doing it downhole are two different things. Put simply, we believe jetting systems are more bark than bite. By contrast, the Viper Drill™ technology quietly but very effectively goes about drilling rock in, as the RPSEA project has shown, a virtually straight line.